Essentially, your heater is a machine that allows you to convert dollars into heated air. “Burning money” is more than just an expression in this context. While you may not like to think of it that way, it does help illustrate why efficiency is so important. The higher your efficiency, the less money you have to burn. Your heater can still deliver hot air even with some worn-out parts. But that would be the equivalent of running a car with some broken parts: it may be possible to keep driving, but disaster can strike at any moment. The cost of heating repair in Chesapeake, VA is one big expense, but before that happens, you’ll also be paying for the inefficiencies. Any issue with your heater’s ability to perform will translate directly into an increase in money spent. While the exact amount can be very small, the issue is when these problems persist day after day. An annual maintenance check can catch these problems before they can persist, allowing you to shave off a chunk of annual expenses. Short cycling doesn’t happen to every heater, but it’s not too uncommon. Every heater will go through heating cycles, each one lasting about 15 minutes. Cycles are a method for heating your home evenly and efficiently. On the other hand, short cycling is when those cycles happen far more rapidly. It forces the heater to turn on and off several times within minutes. This can be very stressful for the heater’s components. Not only that, but short cycling will tank efficiency. It will take much more time and energy for a short cycling heater to heat your home to the temperature on the thermostat. A heater has several moving parts, so when there’s a problem with your HVAC system, it will most likely come from the unit itself. However, you also can’t take the thermostat for granted. The thermostat is essentially the brain for the heating unit. An old and dusty thermostat might be reading temperatures inaccurately. That can force your heater to work longer than necessary. Likewise, a thermostat placed too close to a warm area (such as near the kitchen or in direct sunlight) can skew the temperature reading. For those with a furnace or traditional heat pump, you depend on the ductwork to deliver heated air to all the rooms in the home. 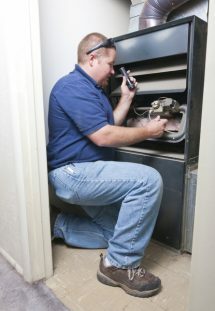 Holes or disconnects in those ducts can be one of the biggest contributors of inefficiency. You won’t be able to see duct leaks, meaning you’ll need to have a duct test performed by a professional. Even though a duct leak may not technically be a “heater malfunction,” it’s worth mentioning nonetheless. Are you dissatisfied with your heater’s efficiency? We can help with that. Contact House Call Company and see how we can make you smile.